England Goalkeeper Paul Robinson Retires From International Football – The Right Decision? Mere hours after he was selected for England’s squad for Wednesday’s ill-timed friendly against Hungary, Paul Robinson announced his retirement from international football. He’s 30 years old. Age is not the issue. Joe Hart is the issue. Flying around Europe only to warm the bench is the issue. “Only now have I been able to make this decision as previously I haven’t been in contention for selection,” Robbo said. Like most England fans, I like Robbo a lot. He seems like a top bloke, which doesn’t count for as much in professional football as it should. He was ruined, effectively, by that freakish bobble in Croatia, for which he was chastised and cast out, unfairly in my view; Steve McClaren really got that call wrong. Whilst one day Robinson might look back on this decision with some small pangs of regret, I understand why he’s made it. International football is not what it was, and he might as well concentrate fully on his club career, which is about to enter its final act. And with Joe Hart the coming man, Robbo must accept that many people do see him as the number three or four keeper in England; or the number two, at best. Right now, I think he probably is the second-best goaly England has (behind Hart), but sadly for him he plays in a position where second place is for losers. Do you think Robinson has made the correct call? His statement should have read “I know I’m not quite good enough at the highest level and don’t have the strength or desire to try and make myself that little bit better in order to be England number 1 for maybe the next 10 years”. 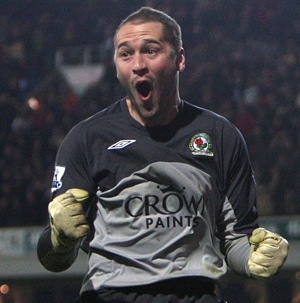 Paul Robinson should be ashamed of himself, goalkeepers are at their prime in their 30s. Clearly has no desire to represent his country at the highest level otherwise he’s be trying to prove he’s a number 1 goal keeper instead of just “seeing” himself as one.